The real star of the show, however, is the multiplayer. 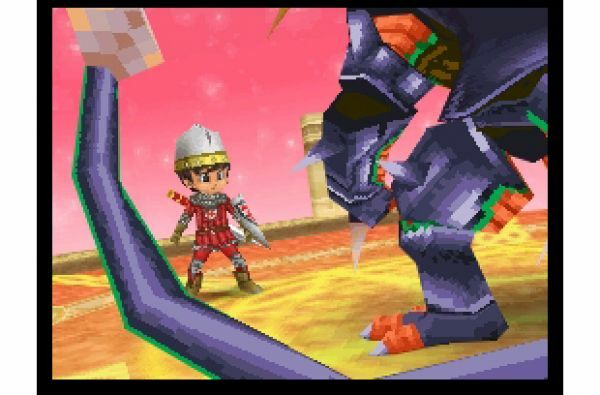 Dragon Quest IX takes almost all of the networking features of the DS and uses them in creative ways. First and foremost, you can invite friends’ characters into your world to adventure in a co-op mode! Not only that, but with the exception of the first hour or so of gameplay, the entire campaign can be played with up to four characters in drop-in/drop-out co-op (local only). After finding three friends, the host player can open their world to visitors and one by one, your buddies can join you. The host player needs to leave their created party members at an inn, as each player who joins your game needs to fill one of their spots in the party. However, each player is free to act as they will, choosing to go off on their own or sticking close to the party as they romp throughout the land. Whenever a player triggers a battle, other players in proximity will also be brought in. If a player is left out, they can always find where the rest of their party is and join the fray mid-battle. It’s a great system, and there’s actually incentive for using human characters over the AI, since player characters have extra abilities that created partners can never obtain. Challenging fights become much more manageable when you have four characters who can help trigger focus attacks rather than just one. There are two drawbacks. First, campaign progress is only saved to the host player’s game, though items, money and experience earned by each co-op partner will be transferred back to their respective saves. Second, other than trivial healing items, you are not allowed to pass any items between players (though they are free to purchase anything available from shops in the host game), which makes sending a player back to their own world loaded for bear a little more difficult. Other networking features include an in-game store that utilizes the Nintendo Wi-Fi Connection to download special deals and items, and the underutilized DS Tag Mode to encounter other players and have them stay at a special inn in your world. Players encountered in this fashion might be able to provide you with unique Treasure Maps, which add a great deal of post-game content in the form of extra-challenging bosses and areas to explore. There is a wealth of content in Dragon Quest IX, and though I was extremely skeptical about how well a turn-based RPG would work in co-op mode, you can color me extremely impressed with the results. The adventure itself may not be the most original thing in the world, the chance to experience it with friends is fantastic. I wish the developers had figured an elegant way to resolve conflicts in story progress, but the decisions they made do a lot to alleviate the pain of having to re-tread content in your own world. If you’ve got access to one or more friends, a taste for JRPGs and a desire to plug dozens of hours into a co-op experience, Dragon Quest IX might just be the game for you. The Co-Op Experience: Up to four players can team up to take on the game, or you can leave the game idle and your character will automatically be added to friends games in range. Page created in 0.9942 seconds.